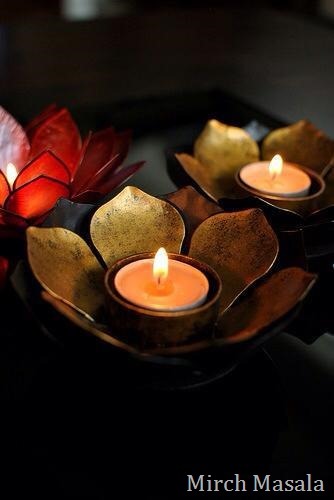 Happy Diwali to all our readers who celebrate this festival of lights. Diwali, as you may have read in previous posts, has a very special place in me and there are so many fond memories associated with this as with any other festivals. Here in Seattle, thousands of miles away from family, we try to recreate as much of what we can of this festival, to still feel warm and happy. We still miss our family back home very much. I have especially been trying to make sure we do not missing out on any festivals, especially for V’s sake. I want him to grow up seeing all this as a part of his day to day life. How much of that he will take forward in his life is up to him. 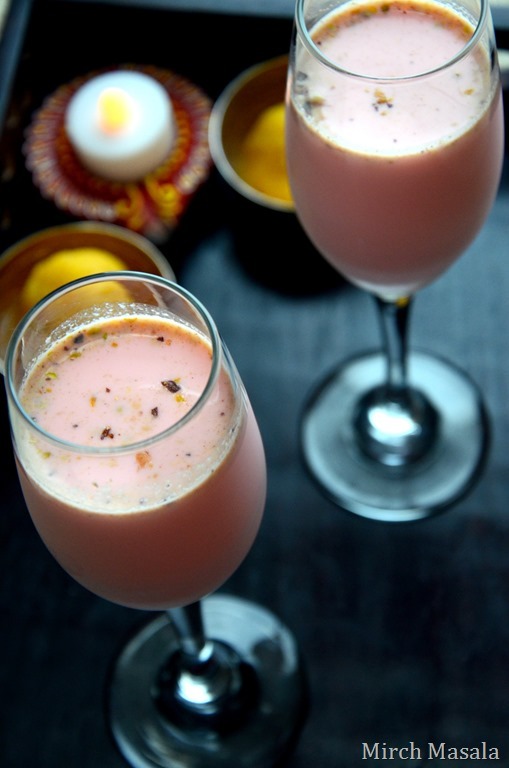 Here is a very refreshing and festive drink for you to serve up during your Diwali party. 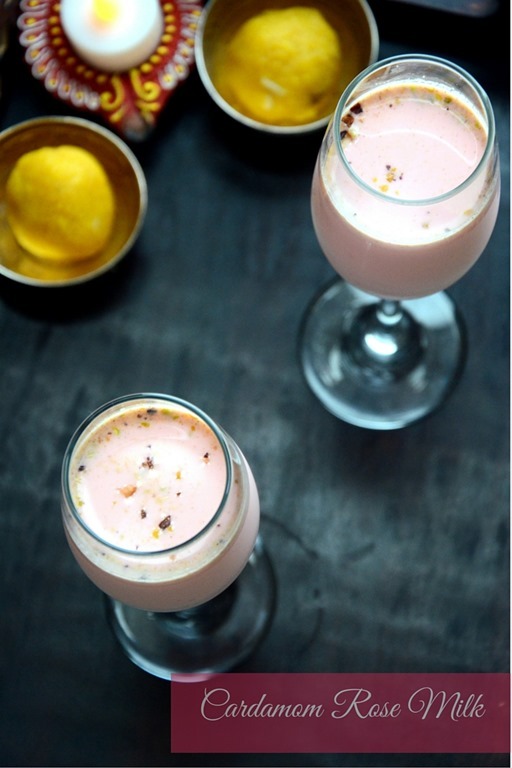 I am always stumped for drinks recipes, that are non-alcoholic, and has some festive touch to it. Rose milk is one of my favorites of all time. 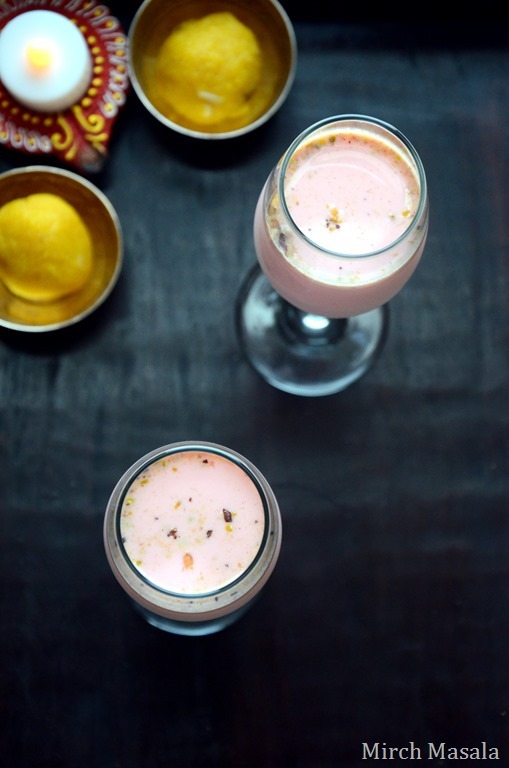 When we visited my paatti (maternal grandmother) for summer vacations, my uncle would take us to Aavin (the Govt milk stores in TamilNadu) and buy us all rose milk. It was so refreshingly light and rich at the same time and especially so in the hot sultry days of summer. I recently had this at a South Indian restaurant here in Redmond and was reminded of it all over again. I went looking for the rose sugar syrup and finally made it at home, my way! 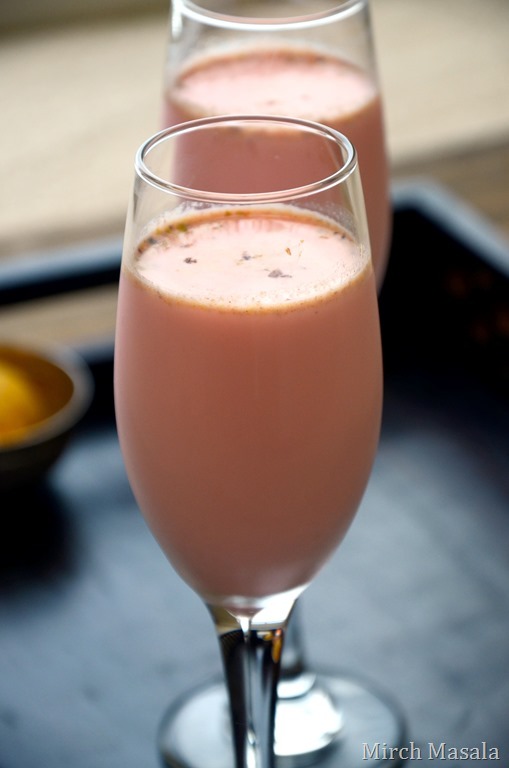 Mix the milk, rose syrup and cardamom together. Pour into tall serving glasses. Top with crushed pistachios. Serve chilled.